Every North Carolinian wants to live in a thriving community. We all want well-staffed public schools for our children to learn the skills they’ll need in adulthood. We all want safe, easy-to-navigate streets so we can get where we need to be. And we all want strong local businesses that support a robust local economy. These are all elements of a thriving community. These are all values that we share. The state budget. Our state budget represents our values in practice. It sets priorities for our communities and impacts our quality of life. And we need a state budget that reflects our communities’ needs and builds thriving communities. Download our budget handbook. 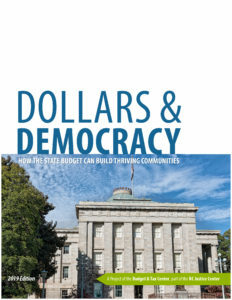 “Dollars & Democracy: How the state budget can build thriving communities” will explain how the budget sets priorities for our communities and impacts our quality of life and will also tell you how you can make sure your community’s needs are reflected in the state budget. For information on prior North Carolina budgets, visit our archives here. The state budget is a reflection of North Carolina’s values and commitment to supporting economic opportunity and investing in the state’s future. The Budget and Tax Center produces rigorous analysis of state budget proposals to determine if they adequately fund public structures and services, particularly those that promote shared prosperity, quality education, and healthy communities. Public Investments – Every year, the Budget and Tax Center produces a report on each of the state budget proposals—from the governor, the NC House and the NC Senate—and one on the final budget. We analyze the budgets to determine if they make adequate investments in education, health and human services, the courts and public safety, transportation and the environment. Legislators often refer to our analyses during budget debates, and public officials and progressive organizations throughout the state rely on our reports to help them understand the state budget and what it means for their communities and issue areas. Fiscal Responsibility – The Budget and Tax Center is the only research organization that looks not only at what investments the state is making but also how it pays for them. In addition to our tax analysis, we look at how decisions about savings, fund transfers, and the use of one-time money affect the state’s long-term fiscal health. The Budget and Tax Center also monitors the transparency and accountability of the budget process. Human Impacts – The budget makes a difference in our everyday lives and the vibrancy of our communities. The Budget and Tax Center works to engage with communities on the budget and its impacts and monitor and document how it is affecting North Carolinians.